WARNER, Oklahoma — A small town football team is doing big things, pioneering the investment in high-tech helmets for the entire district. “It’s not just a select few, they are valuing every kid in this school,” Josh McElyea, a Warner High School parent said. It’s no secret football is a contact sport. In some cases, the harder the hit, the bigger the play. As the game of football gets more competitive, it has created a growing concern: head injuries that can lead to long-term complications. But in the small Muskogee County town of Warner, school officials are squashing the stigma of concussions and football with cutting edge technology. “This community realizes we got to do what big people do, even when we are small,” McElyea said. “That's what you do. You got to plan for that even while you are small." The district is taking the steps to enhance player safety for every football player in the district, grades 6 through 12. Inside each maroon and gold Eagles helmet is Riddell's latest innovation in head impact monitoring technology. An "InSite" training tool inside each helmet builds a player's impact profiles. That means for each hit, a piece of data is recorded in real time, which identifies what part of the player's head was hit and how hard. Players stats will then be stored and compared in a national database with players all over the country. Coaches can then learn from the data and teach players to improve technique. 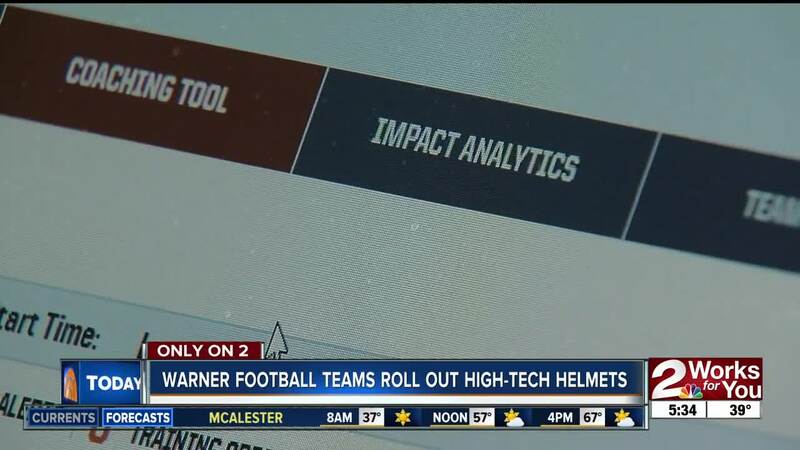 “That feedback that we get from this helmet will help me as a coach to make sure that not only am I teaching proper technique, but my players are performing with that proper technique,” Chuck Capps, Warner High School Head Football Coach, said. Not only that, but the censors will also detect a high impact hit while on the field, which then sends a red flag to the coaches immediately. Coaches and medical personnel monitoring the data can then decide to pull the player from the game and determine if they should see a doctor. “We want to remove that… to be a part of that leading edge, to be a part of removing that fear, that word, concussion from the sport itself,” Capps said. The technology is giving parents peace of mind. And as the season approaches, the Warner Eagles are ready to show out, tackles and all. The school district is one of the first in Oklahoma to invest in helmets for all grade levels. It cost the district around $31,000 for the program, which is something school officials saved up for over the years. This isn’t the district’s first step in player safety. School officials purchased Riddell SpeedFlex helmets for players back in 2015 before buying the InSite technology this year.